Today in class we did a cool activity to teach the kids how the feudal system worked in Medieval Europe. 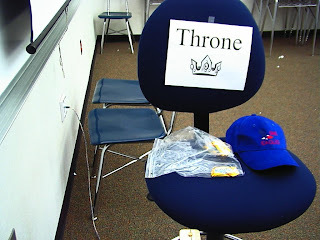 I chose one student to be king or queen. They got to sit on a throne (see picture) and have some food or drink. That monarch then chose 4 lords who had to swear an oath (called homage) to the king or queen. These lords were the leader of 4 corners in the room. The lords then chose a couple of knights for protection and some serfs to work the land. For more on the feudal system, check out http://www.learner.org/interactives/middleages/feudal.html.